Strangely enough, my journey to earning the Navy SEAL Trident began while in the otherworldly trenches of climbing the rungs of a career on Wall Street. It was the 1980s. I was a desk jockey living and working among seven million others crammed into New York City, the financial and media capital of the world. Not what comes to mind as an idyllic place to prepare for the menacing gauntlet of trials that await at BUDS, where most of the round-the-clock sand-and-sea training takes place on an island much different than Manhattan, one named Coronado. Talk about otherworldly. Yet it was in NYC that through some mysterious mix of instinct, intuition and serendipity, I bumped into a Seido karate studio that would open my mind and heart toward listening to my truest self and setting forth toward becoming a Navy SEAL. The uniquely multi-dimensional aspects of Seido training prepared me to not only successfully graduate from BUDS, but my performance also earned recognition as Honor Man of the class—training executed in a midtown dojo in a building anchored to Manhattan Island bedrock. This was the thing about Seido: Unlike many of martial arts practices, you don’t just talk about the mental and spiritual aspects of training—you do them. A typical session included the fighting practice of course, but this was routinely buffeted with meditation time and discussions on the spiritual currents running through the study. It was through this brand of work where I discovered an inner, sincere voice and self-honesty that ignited a change of course in my life, from the high-rise Rat Race to life on the Teams, from which I have never looked back. Seido also offered me what I now know can be described as an integrated practice. At the time, I was not fully aware how rare and crucial such a training practice is. Perhaps my first glimpse of how potent Seido was as a practice was how well it had prepared me for the endless tests and rigors of BUDS. 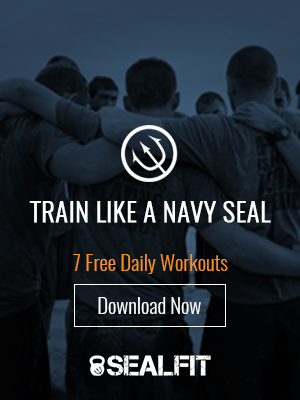 As a newly minted Navy SEAL, I made a pledge to find a similar practice that could be attended to on a daily basis and help me unearth the inner capacities toward the maximum performance. I detail that search in my upcoming book, Warrior Yoga. The gist is that it was much harder to find such an all-powerful practice than I expected. Ultimately, and surprisingly I might add, it was a version of yoga that organically developed through this search that once again allowed me to sustain—in a single session—a method where I could attend to the development of my physical and spiritual strength, harnessing and honing a variety of innate skills and functions like concentration, intuition, presence, mental toughness and more. In this blog series, we’ll explore the complete picture of how Warrior Yoga binds together so much in a single, adaptable practice. For now, I’d like to introduce you to the starting point in Warrior Yoga. It’s an on-ramp of self-examination brought forth through the ethical disciplines drawn from the ancient foundations of yoga itself. For those familiar with my work in Unbeatable Mind and The Way of the SEAL, you’ll recognize the emphasis in establishing your “Why”—the key and omnipotent ingredient you’ll need in successfully pursuing any challenging goal that is worth pursuing. In Warrior Yoga, we start with this earnest examination of the disciplines as a means toward taming the body, mind, and senses so that we can advance our training through concentrated study and meditation. Ideally we do this in a daily ritual, with a journal, posing questions that we may have avoided for many years. Questions like: Do you think you are content? Do you talk about contentment and do you act content? Upon deep reflection you may find that there are subtle differences in each of these, and this awareness leads you to work toward their alignment. In the journal, we write down—without judgement—any insights and discoveries that allow us to unveil and establish our values and ethical foundations that become our own personal ethos. And “What will I do about this now?” Getting into the heart of these questions leads to understanding and connecting with the very essence of your being as a human. This is where the daily churn of practice in Warrior Yoga gets started, intently focused on connecting with our true purpose in life. It’s in finding and honoring our true purpose, we make the crucial leap of faith from wishing for the Warrior life to living the Warrior life, taking the first steps on a journey toward honorably serving others and realizing our most profound gifts. As we discussed in the first of this series, my intent here is to offer what may be a much different idea for you about what yoga is and what yoga can do for you. To accomplish this task, next week I’ll take you on a tour of the principles built into Warrior Yoga that make it distinct. Until then, train smart, train hard.